Siro Martinello was born in Italy on May 10, 1933. He was a President of the Windsor Minor Hockey Association and Manager of Windsor Arena for over 25 years. His successful sports career in fastball and basketball was cut short by a long struggle with tuberculosis. Martinello retired from competition in 1958 and redirected his love of sports into coaching and managing. 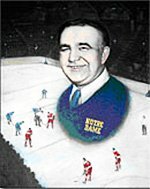 In 1966 he became the first President of the Windsor Minor Hockey Association and he held this position for 22 years. He was also a Manager of the Windsor Arena, where he worked endlessly to support young people in the Windsor-Essex community. He was a mentor to many and helped steer youth along a path towards education, providing them with the opportunity to receive sports scholarships to College and Universities. Siro Martinello passed away on January 27, 1983. His legacy, the pursuit of excellence in education, sport, and community involvement, lives on in the form of “The Siro Martinello Memorial Bursary Found”. Martinello a man of great kindness Series: Windsor/Essex County Sports Hall of Fame Inductees: By Mary Caton Star Sports Reporter. The Windsor Star [Windsor, Ont] 06 Oct 1993: B5. Accessed from Canadian Newsstand from Windsor Public Library’s Databases.